A professional wide toothed comb from Pro-Tip. Perfect for combing wet products like shampoo, conditioner or treatments through hair. Measures 245 mm so is great even for long hair. Features wide teeth which pass smoothly through the hair, helping to detangle without breaking hair. 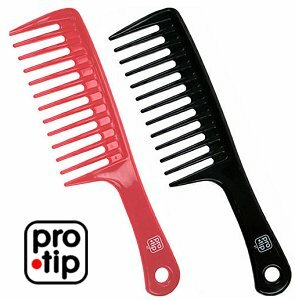 Pro-tip combs are made from a superior grade of plastic, and are finished by hand to enhance performance at the highest level. Ideal for use whilst shampooing or for combing conditioners and treatments evenly through hair. A great detangler.